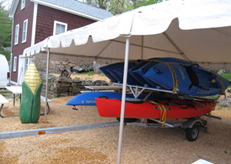 Queen's River Kayaks is a full service kayak company providing it all...life jackets, paddles, maps, dry bags, transportation, and of course...kayaks. Just bring youself, family and friends...and we will send you on your way. We will even pick you up when you are done. Queen's River Kayak Company, formally Kayak Today was owned an by a local mom & dad who loved to be outdoors and in and on the water. Dad, the fisherman was quite good at finding fish, and mom, the nature enthusiast just loved exploring the outdoors. Founding the company in 2006, the family ran it together successfully for several years. We thank Marie & Dennis for their many hours of dedication and loving care! Queen's River Kayak Company changed ownership in May 2009. Its new owner, Paul Drumm III, also owns Kenyon's Grist Mill, a historical attraction and the second oldest continuously operating business in Rhode Island. Nestled along the Queen's River in Usquepaugh, this location makes the perfect hub for kayak rentals. Since his father, Paul Drumm Jr. bought the mill in 1971, Paul has always been fascinated with nature's beauty surrounding him. As he grew up understanding the importance of family business and tradition, he was honored to carry on yet another one. To him, kayaking is just another opportunity to grow with family and friends...proving that working and learning together is an unforgettable experience.